Another month is behind us and I am happy to report that things in class are going very well. Level 4 continue to impress me with their adherence to class rules, as well as their ability to speak English at all times – even during break and before / after classes. Keep up the great work. We will be moving into our exam period next month and I am confident that everyone will do well. 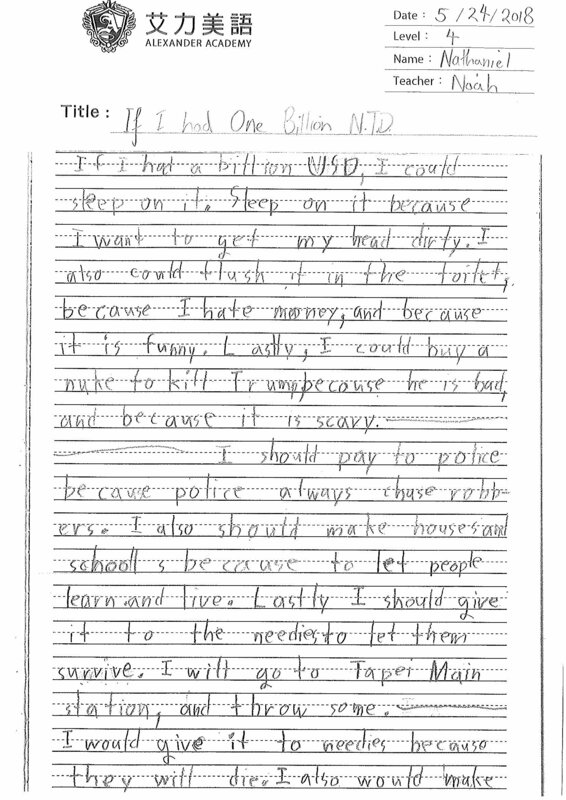 In writing class we completed a project titled ‘If I had 1 Billion NTD’ where I asked the students to talk about what they would do with a pile of money. I used this topic as a vessel to teach the modal verbs could, should and would. All of the stories were light-hearted and very funny, especially some of the could ideas. Students will present their stories to their classmates this coming week in the form of an oral speaking class. This is always a highlight of our month and a lot of fun. In science we began looking at forces. We did a unit on buoyancy and talked about how this is useful to humans, machines and animals alike. We had a big water bucket in class that students could test buoyancy of various objects in, and I tasked them with creating an object that neither sunk nor float which proved difficult. We spent some time talking about magnets and how they work. Finally we finished by looking at matter in its many states. We had an exciting class experiment where we made CO2 gas using everyday ingredients and used it to extinguish small candles, a great way to view the buoyancy and consistency of different gases which tied the month’s units together nicely. In social studies we looked at different ways to measure countries. We started by learning about the Human Development Index (HDI), which is basically ‘how good is a country to grow up in’. Following this we did a unit on poverty, and students were put to task to think of ideas to combat poverty in a small African country. We then spent a week looking at evolution and the history of the human species. We finished the month by learning about the history of life on earth going back 500 million years. In our grammar classes we spent a lot of time with the verb ‘to be’. I noticed students were still making small mistakes while using this in their writing so we practiced its more complicated usage, including the continuous tense. We then spent a week looking at some of the finer rules when dealing with nouns, namely the countable/uncountable distinction. We had some extremely fun research classes too. We looked at Polynesia and Easter Island where students had the chance to sculpt a Maui statue from clay. Then we looked at Germany and we baked pretzels to share in class. We finished the month with a short look at India before beginning our preparation for the end of year show. In all Level 4 and I continue to create an excellent atmosphere for learning English and have fun while doing so. I look forward to helping them through their exams over the next month.